Once again its time to let pumpkin take you right through the holiday season. This unforgettable cake is pretty enough for any holiday celebration. Grease and FLOUR baking sheet pan. Dishtowel bigger than your sheet pan-or you can use parchment paper. 1/8 cup Confectionary Sugar to sprinkle over top of dishtowel. Sift together flour, baking soda, ginger, white pepper, nutmeg and salt. Slowly add sugar into beating egg mixture. Incorporate and turn off mixer. In a separate bowl combine lemon juice and pumpkin. Gently fold pumpkin mixture into the egg mixture. And gently fold in Flour mixture into egg mixture. Pour batter onto GREASED AND FLOURED baking sheet and spread evenly making sure to reach all the way into every corner. Sprinkle with half your walnuts. Loosen around edges of cake with a spatula. Sprinkle dishtowel generously with powdered sugar to prevent cake from sticking later. Quickly roll towel and cake together and let cool. 2 cups Confectionary Sugar in small increments until blended. Unroll cooled cake. Spread half the frosting evenly over entire cake. Reroll cake. Set cake seam down onto oblong platter. Frost with remaining frosting using long smooth strokes. Sprinkle down the center with remaining nuts for decoration. If making cake for another day do not frost. Just foil and refrigerate until ready to serve. Then frost and place in refrigerator for 1 hour before serving. This entry was posted on Sunday, November 22nd, 2015 at 3:40 am	and posted in Category. You can follow any responses to this entry through the RSS 2.0 feed. we’ll take three. do you deliver? 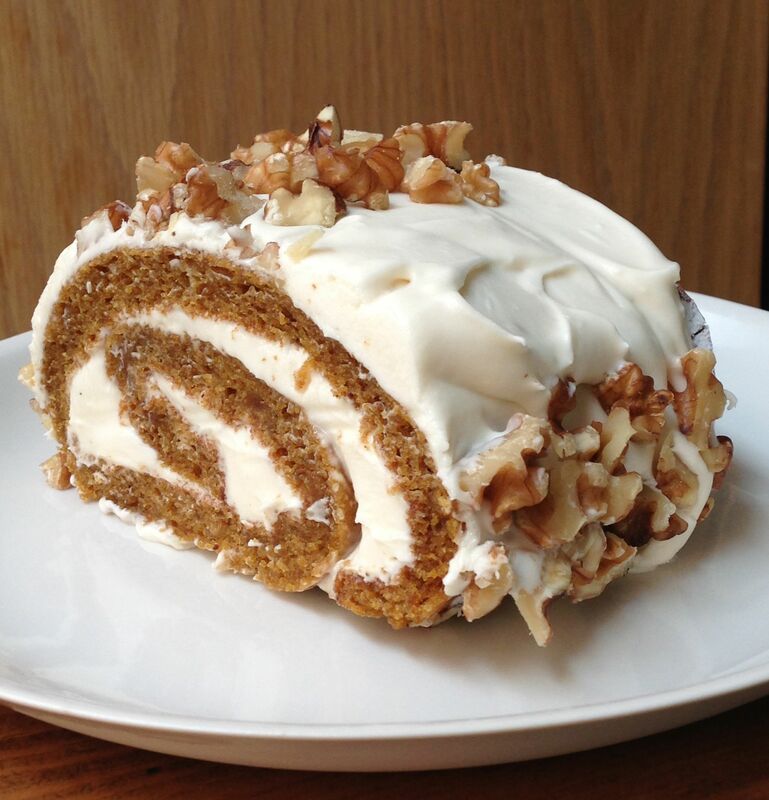 This pumpkin roll is a family favorite! So yummy!